These systems were first developed in Japan where space saving and energy efficient options were required for heating and cooling the home. Since the technology has matured over the years making these systems much more attractive options in your home or business. These cooling systems also known as mini-split System can replace the traditional central ducted system and work similar to the traditional air conditioner. With Ductless AC’s, a condensing unit is located outside the home which contains the compressor where it circulates the refrigerant to produce the cooling effect. There are several types of compressors but the latest innovation is inverter technology that allows the compressor to operate at unlimited number of speeds. 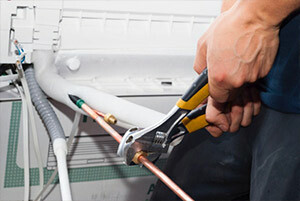 These units normally start at full speed when there is the need for heating or cooling. In ductless systems, the refrigerant from the outdoor condensing unit is sent directly to an indoor unit located on the wall or ceiling of a particular room. 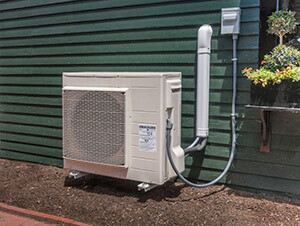 The ductless ac system is usually controlled through a remote. This option allows you to set the temperature, change the modes of operation, and set timers and other advanced functions. As technology has changed drastically, Ductless AC’s have developed some of the most advanced units that include a temperature sensor in the remote. This high tech system is commonly called “I FEEL”. The system is beneficial because it senses the room temperature at the remote and not high on the wall. This allows for better comfort. Other units have optional wall mounted controllers. Include advanced modes of operation: the turbo mode or quick cool mode. Also have a dehumidify or dry mode operating at lower speeds to increase the amount of moisture removed from the air. If your in the market for new ductless AC or looking to repair and service your exiting unit Five Lions is the company with highly trained professionals with years of experience ready to help.